Where to buy in the states? �MaurysMusic.com is proud to be Orchid Electronics' only US dealer! 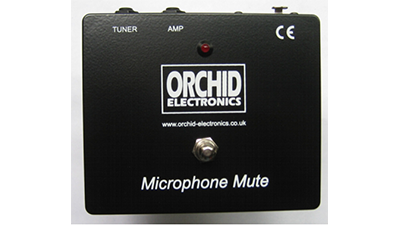 A unique design for use with high quality balanced microphones - this product has a silent mute facility - which many players will find invaluable for use on stage - when changing instruments, or quiet tuning. Buffered low impedance output on a jack socket to feed backline amplifier or on stage monitoring. This output mutes. Balanced XLR output at microphone level to feed the mixing console. Buffered tuner output available at all times, irrespective of mute state. Red LED indicates output mute status. Must be Phantom powered from the mixer - this is passed to the microphone and used to power the circuitry. Momentary footswitch, mechanically quiet in operation - mute action latches electronically.